These little darlings were just made for brunch and mid-day dinner spreads. They are just the right size to be picked up and popped all at once or in two bites. The flavors mingle well. The texture of the phyllo cups offers a pleasing crunch to go with the sweet and savory one-two punch of the apricot preserves and the brie. 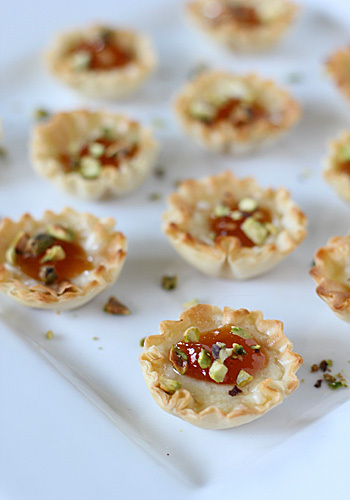 The chopped roasted pistachios lend a nutty note to the affair. While there is a lot going on with the flavors here, these cups retain crowd pleasing characteristics sure to make them a hit with a wide range of palates. The ease of preparation with just four ingredients really seals the deal in making this recipe a go-to appetizer favorite. Preheat the oven to 325° F. Place the phyllo cups on a parchment lined baking sheet. Fill each cup with a cube of cheese and a top with a 1/2 teaspoon of preserves. Bake until the phyllo is warmed through and the cheese is melted, about 5 minutes. 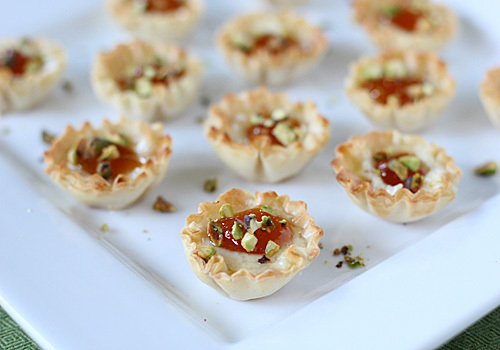 Transfer the warm cups to a serving platter and sprinkle with the pistachios. Serve warm. Enjoy! Have you already posted the lemon cakes? The whole idea is really making my mouth water. These little cups look good too but somehow I never seem to get around to appetizers. Nicole, it is time to do the cake recipe, it is Meyers lemon season, I am picking mine today and they have been ripe for over a month. Just a little prod, I love Meyers Lemons and what they are made in. Thanks for the reminder, Bobbi. I will put it on the to-do list☺. These are so cute! What a great appetizer for summer entertaining.